The 32nd Metropolitan Administration Seminar was held on May 31, 2018, at the International Conference Room; located in the Natural Science Building. 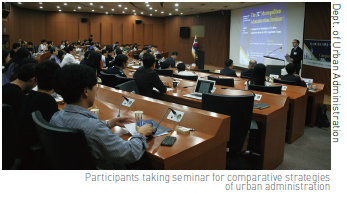 This seminar was organized by the Department of Urban Administration and six faculties participated in this seminar as panels, including the moderators of this seminar, Professor Lee Tae-wha and Jason Kovacs. Additionally, Randall S. Abate, from the Florida Agricultural and Mechanical University, participated in this seminar as a speaker. To start with, welcoming remarks were given by Yang Seung-woo, the Dean of the College of Urban Science. And then, Lee Dong-kwan, a professor in Yonsei University, presented on the topic Disaster Management Strategies in Korean Cities. Next, an American speaker, Randall S. Abate continued with a presentation on the Legal Framework for Climate Change Adaptation Strategies in American Cities. Finally, Hwang In-chang, a researcher of The Seoul Institute, introduced Air Pollution Management Strategies in Korean Cities. After the presentations, four faculties; Im Dong-kyun (Dept. of Urban Sociology), Lee Shin (Graduate School of International School of Urban Science), Dong Jong-in (School of Environmental Engineering), and Lee Seung-il (Dept. of Urban Planning and Design), participated in a panel discussion about this seminar. With questions and suggestions from the audience, this discussion lasted about one hour.